Delta proudly supports the communities where the company's 80,000 employees live, work and serve. That commitment grows even stronger when those communities are thrown into crisis. In response, Delta Air Lines, its Cargo division, the Delta Foundation and the company's employees have mobilized like never before: partnering with the American Red Cross and other experienced non-profits, contributing $3.75 million, operating relief flights filled with thousands of pounds of water, generators, baby food and other supplies; and adding dozens of flights to evacuate tens of thousands of people to safety. "Delta's commitment to the people of these communities, and our employees' deeply ingrained culture of service, means we will work in every way possible to address the humanitarian needs," said Delta CEO Ed Bastian. "The people suffering from these terrible disasters are our neighbors, friends and family. We are grateful to have the ability to join in helping to serve the people in need in this time of crisis." Financially, Delta generally provides aid through contributions to non-profit agencies such as the American Red Cross who are on the ground and best know the needs of the affected communities. Delta has partnered with the Red Cross since 1941 when it operated its first relief flight carrying blood for the aid group. Delta Cargo ships supplies when circumstances indicate that's the best approach. $1 million to American Red Cross Annual Disaster Giving Program participant (Delta Air Lines Foundation). $1 million: American Red Cross Irma Relief Fund. $500,000: Cruz Roja Mexicana (Mexican Red Cross) for earthquake relief. $500,000: Fundación Alfredo Harp Helú, a Mexican non-profit, for earthquake relief. $250,000: American Red Cross Maria Relief Fund. $250,000: International Federation of Red Cross plus British, Dutch and French Red Cross organizations for Irma Relief for Caribbean island nations and overseas territories such as British Virgin Islands, Anguilla, St. Maarten. $190,000: Total individual employee donations to American Red Cross for disaster relief. Delta operated two relief flights to the Houston airports after Hurricane Harvey caused historic flooding across southeast Texas. A 737 delivered cots, clothing, paper goods, fresh and non-perishable foods, personal hygiene items, water and hot meals. Delta added dozens of flights on upsized aircraft to Florida and the Caribbean – as large as the Boeing 747, mostly reserved for international routes - to help evacuate thousands of people before Hurricane Irma hit. In all, Delta added more than 12,000 seats departing Florida and the Caribbean in the days before Irma hit. Before Hurricane Irma hit Puerto Rico, Delta operated the last flight in and out of the island, evacuating 173 customers when other airlines had abandoned attempts to fly into San Juan. Six Delta humanitarian flights flew to Puerto Rico, Turks and Caicos, St. Thomas and St. Maarten, carrying Red Cross staff, volunteers and hundreds of thousands of pounds of supplies including water, satellite phones, batteries, phone chargers and non-perishable food. 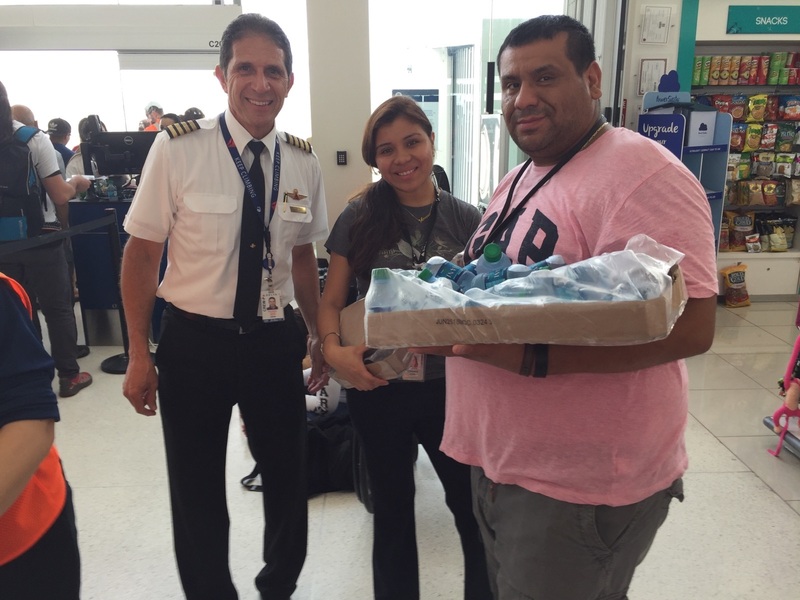 Just Tuesday, Delta operated three flights containing 33,000 pounds of water, generators, blood, food and other supplies to help people stuck at the San Juan airport and elsewhere in Puerto Rico. Delta's Cargo team is also coordinating delivery of supplies to Puerto Rico donated by Delta business partners. Numerous Delta employees undertook humanitarian efforts as part of outside charities or the U.S. military. Delta Cargo employee Ashley Ivory was honored by Delta for her work providing security and assisting law enforcement in Orlando as a member of the Georgia Army National Guard after Irma struck Florida. 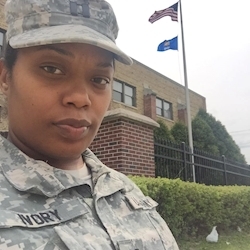 "It's a humbling experience to serve my country and our people in times of need, all the while upholding Delta's values of servant leadership and integrity both within and outside of the workplace," Ivory said. After Harvey swamped Houston, pilot Scott Tobias traveled from his Cincinnati home to Houston with a disaster aid group, helping to rescue residents of a retirement home. And after Irma made landfall, Mike Rutigliano and Sean Garell, two New York-based pilots who are part of the New York Air National Guard, took on a mission to rescue Americans stuck in the Caribbean. Disaster relief is just a small part of Delta's commitment to giving back to the community, which has been at the heart of Delta's mission for more than 80 years. Since 2016, Delta has pledged to give 1 percent of net profits to charity. Last year that added up to about $37 million, ranging from support for Junior Achievement educational programs to Habitat for Humanity homes to KaBOOM! playground builds and much more.